Snowman (317/365) – Annoyingly Boring? Long before I got my hands on the D70 James sent me I had been thinking that I wanted to experiment shooting intentionally out of focus light. This was my first attempt. I’ll keep at it. Rupe wants you to know he has thoroughly enjoyified your Project 365 since being introduced to you. Much as it may seem to be played to death in Rupe’s eyes (seems everybody and his brother has some form or another of this project), Rupe’s highly considering doing same. The recently acquired (Black Friday) camera is beckoning Rupe. The daunting daily shooting and posting is not, however. Advice and learnings from PG mistakes would be greatly appreciated and possibly mind-swaying for the better. Rupe’s all about learning from mistakes, as you well know. His ownself’s … and others’. P.S. Rupe has a leg up: He might have an advantage on the “out-of-focus” dynamic …..
Maybe it’s my monitor, but that picture looks to be a bit blurry to me. Could use that to make some cool graphics, logos or something like that. 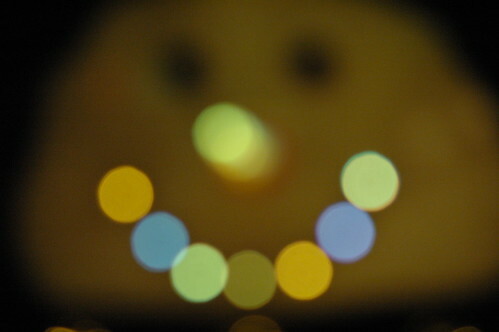 I’m totally digg’n the colored bokeh!